UNC President Margaret Spellings and UNC Board of Governors Chairman Harry Smith. UNC President Margaret Spellings confirmed Friday that she will be stepping down from her position. Her official exit will come March 1, 2019 – three years since she was hired to lead the 17 campus UNC system. 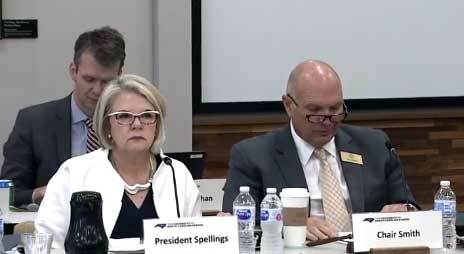 “All leaders are for a time,” Spellings said after a two hour closed session of the UNC Board of Governors Friday, during which the board finalized the terms of her exit. Now, she said, is the time for a new leader for UNC. The exit was a mutual decision, Spelling said. It was prompted by Spellings suggesting to UNC Board Chairman several weeks ago that it was time to leave, she said. Calling the decision “personal,” she denied tensions with the UNC Board of Governors and the political tumult of her time as system president played a part in her decision to leave. Spellings has consistently denied persistent rumors she was looking to leave her post. Earlier this month she said she would “absolutely” be remaining in her position. Asked by reporters Friday what had changed, Spellings said she has been continually evaluating her position and options. Spellings said she has no other position lined up but expects to return to Texas. This summer she denied a report a report from the Austin American Statesman that she was in the running to become president fo the 14-campus University of Texas system. Spellings dismissed the report as a rumor, said she wasn’t job hunting and she planned to be at UNC for a while. Chairman Harry Smith, who is part of a particularly conservative faction of board members who have clashed with and been highly critical of Spellings, praised her tenure as president Friday. Smith said the board will seek an interim chancellor before doing a full search but is not in a hurry and wants to get it right. Spellings will get a separation payment of $500,000 and $35,000 in relocation expenses. She will get the regular executive retirement contribution of $77,500 as she continues in the position with salary and benefits until March 1, 2019. Asked about the political controversies and challenges of her tenure Friday – from the Silent Sam controversy to struggles for authority with the board and even major hurricanes – Spellings was philosophical.